Join Yangsi Rinpoche (teaching in English) at LMB for two full days of instruction on the profound Mahamudra meditation practice. All levels of students are welcome to attend all sessions. No prerequisites required. Mahamudra is a Sanskrit word that literally translates to “the great seal”. What this means is that all phenomena are “sealed” in emptiness, pointing to the ultimate nature of all phenomena as being empty of inherent existence. Mahamudra is a meditation technique that points the meditator to directly view the ultimate nature of mind by meditating on the emptiness of the mind itself. The meditation uses the union of single pointed concentration on the conventional clarity of the mind and the ultimate nature of the mind. Schedule for Both Saturday, Nov 10 and Sunday, Nov 11. LMB unable to serve lunch during these teachings. Please bring a lunch or plan to drive to lunch during break. Yangsi is the founder and president of Maitripa College, in Portland, Oregon. Yangsi Rinpoche was recognized as the reincarnation of Geshe Ngawang Gendun, a renowned scholar and practitioner from Western Tibet, at the age of six (see archival video of his enthronement below). Rinpoche trained in the traditional monastic system for over twenty-five years, and practiced as a monk until the age of 35. In 1995 he graduated with the highest degree of Geshe Lharampa from Sera Je Monastery in South India. He then completed his studies at Gyume Tantric College, and, in 1998, having the particular wish to benefit Western students of the Buddhadharma, Rinpoche came to the West to teach and travel extensively throughout America and Europe. He served as a resident teacher at Deer Park Buddhist Center in Madison, Wisconsin for five years, and is currently the Spiritual Director of Ganden Shedrup Ling Buddhist Center in San Juan, Puerto Rico and Spiritual Director of Dharma Friendship Foundation in Seattle, Washington. 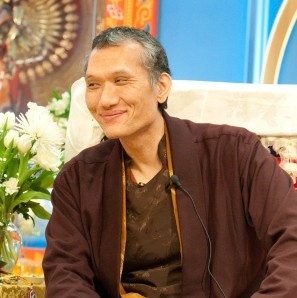 He founded Maitripa College in 2005 in Portland, Oregon. Rinpoche is the author of Practicing the Path: A Commentary on the Lamrim Chenmo, published in 2003 by Wisdom Publications. Rinpoche teaches in English, and is admired wherever he travels for his unique presentation of the Dharma, his interest in and enthusiasm for Western culture, and his evident embodiment of the wisdom and compassion of the Buddhist path.